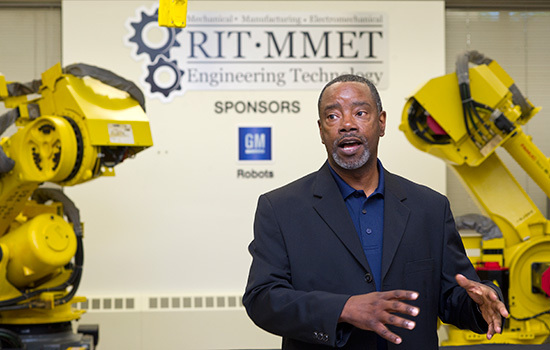 General Motors donated two heavy-duty industrial robots to RIT’s College of Applied Science at Technology on July 22. Steve Finch, plant manager of GM-Tonawanda, participated in the dedication event, highlighting the prospects of RIT’s students using the robots to learn more about next generation manufacturing and automation. General Motors donated two heavy-duty industrial robots to Rochester Institute of Technology to be installed in the Materials Laboratory located in RIT’s College of Applied Science Technology. The Fanuc R2000iA/210F robots are used in contemporary manufacturing processes and had been used in two of GM’s plants to build its Chevy Cruze automobiles as well as the larger Chevrolet Tahoe, GMC Yukon and Escalade luxury and utility vehicles. “The donation is part of an annual effort by GM to get robots that are no longer needed due to process changes into the hands of students who are training to be the next generation of engineers and technicians,” said Bob Berger, manufacturing robotics engineering at GM’s Warren Tech Center in Warren, Mich. “These are hard-to-come-by robots that allow students to learn controls engineering and other robotics-related jobs by actively working on actual robot technology used in the automotive industry.” Berger was on hand with Steve Finch, plant manager of GM’s Tonawanda Engine Plant, for the dedication event in the lab at RIT on July 22. RIT’s undergraduate and graduate students will have access to the equipment for coursework in CAST’s mechanical and manufacturing engineering technology degree programs. They will use the equipment to learn more about robot operations, programming and simulations. This foundational work will be applied to broader areas in welding, material handling and automated storage and retrieval. The donation came about from a discussion between Manian Ramkumar, department head of RIT’s mechanical and manufacturing engineering technology department, and Finch, who has been involved in GM’s regional efforts to support STEM initiatives in grade schools and universities. Donations such as this are steps to help develop the next generation of workers. Also participating in the dedication was Karen Shed, human resource manager at GM-Rochester. Since 2011, 19 RIT graduates were hired by the company locally, seven of which began as co-ops or interns. “With over 35 percent of GM Rochester’s salaried workforce RIT alums, clearly our recruitment strategy strongly prefers RIT grads,” she said.